Soaking tub - If you want to have a tub available but are pressed for space, consider a Japanese tub. This type is slightly smaller than a traditional bathtub, but it is perfect for saving space. Clever storage solutions - Keep all your soaps, shampoos and toiletries carefully tucked out of the way with cubbies, pullout shelves and more. This keeps supplies right at hand while streamlining the design of your dream bathroom. A view - Those who have striking outdoor scenes outside their windows can take advantage by incorporating a view of the outdoors into master bath features. Wooden bathroom features - While not a traditional bathroom design material, wood has become increasingly more popular in recent years. Its advantages lie in its warm look and feel that can be manipulated to make a bathroom design more comforting and appealing. In-home sauna - A sauna provides the ultimate in luxury year round and takes up much less space than you might at first assume. 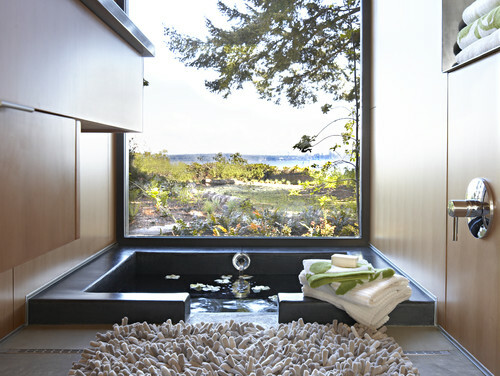 A bath within the bedroom - Many people enjoy adding a bath to the master bedroom. This luxurious addition can make for a more convenient shower or bath before bedtime. Double shower - Have you felt cramped and uncomfortable in your shower? A double shower allows you to enjoy a spacious and convenient spot for bathing. Residents of the Dallas area who are contemplating a master bath redesign can contact Stephanie Kratz Interiors for a helpful consultation.